The fair opened in May and ran through October 30, 1893. Forty-six nations participated in the fair (it was the first world's fair to have national pavilions), constructing exhibits and pavilions and naming national "delegates" (for example, Haiti selected Frederick Douglass to be its delegate). The Exposition drew nearly 26 million visitors. The fair was originally meant to be closed on Sundays, but the Chicago Woman's Club petitioned that it stay open. The club felt that if the exposition was closed on Sunday, it would restrict those who could not take off work during the work-week from seeing it. The exposition was located in Jackson Park and on the Midway Plaisance on 630 acres (2.5 km2) in the neighborhoods of South Shore, Jackson Park Highlands, Hyde Park and Woodlawn. Charles H. Wacker was the Director of the Fair. The layout of the fairgrounds was created by Frederick Law Olmsted, and the Beaux-Arts architecture of the buildings was under the direction of Daniel Burnham, Director of Works for the fair. Renowned local architect Henry Ives Cobb designed several buildings for the exposition. The Director of the American Academy in Rome, Francis Davis Millet, directed the painted mural decorations. Indeed, it was a coming-of-age for the arts and architecture of the "American Renaissance", and it showcased the burgeoning neoclassical and Beaux-Arts styles. The World's Columbian Exposition was the first world's fair with an area for amusements that was strictly separated from the exhibition halls. This area, developed by a young music promoter, Sol Bloom, concentrated on Midway Plaisance and introduced the term "midway" to American English to describe the area of a carnival or fair where sideshows are located. It included carnival rides, among them the original Ferris Wheel, built by George Washington Gale Ferris Jr. This wheel was 264 feet (80 m) high and had 36 cars, each of which could accommodate 40 people. The importance of the Columbian Exposition is highlighted by the use of rueda de Chicago ("Chicago wheel") in many Latin American countries such as Costa Rica and Chile in reference to the Ferris wheel. One attendee, George C. Tilyou, later credited the sights he saw on the Chicago midway for inspiring him to create America's first major amusement park, Steeplechase Park in Coney Island, New York. The fair included life-size reproductions of Christopher Columbus' three ships, the Niña (real name Santa Clara), the Pinta, and the Santa Maria. These were intended to celebrate the 400th anniversary of Columbus' discovery of the Americas. The ships, a joint project of the governments of Spain and the United States, were constructed in Spain and then sailed to America for the exposition. The ships were a very popular exhibit. Eadweard Muybridge gave a series of lectures on the Science of Animal Locomotion in the Zoopraxographical Hall, built specially for that purpose on Midway Plaisance. He used his zoopraxiscope to show his moving pictures to a paying public. The hall was the first commercial movie theater. The "Street in Cairo" included the popular dancer known as Little Egypt. She introduced America to the suggestive version of the belly dance known as the "hootchy-kootchy", to a tune said to have been improvised by Sol Bloom (and now more commonly associated with snake charmers) which he had composed when his dancers had no music to dance to. Bloom did not copyright the song, putting it immediately in the public domain. Also included was the first moving walkway or travelator. It had two different divisions: one where passengers were seated, and one where riders could stand or walk. It ran in a loop down the length of a lakefront pier to a casino. Although denied a spot at the fair, Buffalo Bill Cody decided to come to Chicago anyway, setting up his Buffalo Bill's Wild West Show just outside the edge of the exposition. Nearby, historian Frederick Jackson Turner gave academic lectures reflecting on the end of the frontier which Buffalo Bill represented. Louis Comfort Tiffany made his reputation with a stunning chapel designed and built for the Exposition. After the Exposition the Tiffany Chapel was sold on several times, even going back to Tiffany's estate. It was eventually reconstructed and restored and in 1999 it was installed at the Charles Hosmer Morse Museum of American Art. Architect Kirtland Cutter's Idaho Building, a rustic log construction, was a popular favorite, visited by an estimated 18 million people. The building's design and interior furnishings were a major precursor of the Arts and Crafts movement. Among the other attractions at the fair, several products that are well known today were introduced. These products included Juicy Fruit Gum, Cream of Wheat, and Pabst Blue Ribbon beer, among many others. There was an Anthropology Building at the World's Fair. Nearby, "The Cliff Dwellers" featured a rock and timber structure that was painted to recreate Battle Rock Mountain in Colorado, a stylized recreation of American Indian cliff dwelling with pottery, weapons and other relics on display. There was also an Eskimo display. There were also birch bark wigwams of the Penobscot tribe. The John Bull locomotive was displayed. It was only 62 years old, having been built in 1831. It was the first locomotive acquisition by the Smithsonian Institution. The locomotive ran under its own power from Washington, DC, to Chicago to participate, and returned to Washington under its own power again when the exposition closed. In 1981 it was the oldest surviving operable steam locomotive in the world when it ran under its own power again. John Bull on display at the exposition. An original frog switch and portion of the superstructure of the famous 1826 Granite Railway in Massachusetts could be viewed. This was the first commercial railroad in the United States to evolve into a common carrier without an intervening closure. The railway brought granite stones from a rock quarry in Quincy, Massachusetts, so that the Bunker Hill Monument could be erected in Boston. The frog switch is now on public view in East Milton Square, Massachusetts, on the original right-of-way of the Granite Railway. Forty-six countries had pavilions at the exposition. Norway participated by sending the Viking, a replica of the Gokstad ship. It was built in Norway and sailed across the Atlantic by 12 men, led by Captain Magnus Andersen. In 1919 this ship was moved to Lincoln Park. It was relocated in 1996 to Good Templar Park in Geneva, Illinois, where it awaits renovation. 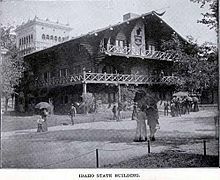 United States states also had their own pavilions. The work of noted feminist author Kate McPhelim Cleary was featured during the opening of the Nebraska Day ceremonies at the fair, which included a reading of her poem "Nebraska". Among the state buildings present at the fair were Connecticut, Massachusetts, New Jersey, New York, and Pennsylvania; each was meant to be architecturally representative of the corresponding states. Four United States territories also had pavilions: Arizona, New Mexico, Oklahoma and Utah. Visitors to the Louisiana Pavilion were each given a seedling of a cypress tree. This resulted in the spread of cypress trees to areas where they were not native. Cypress trees from those seedlings can be found in many areas of West Virginia, where they flourish in the climate. The Illinois was a detailed, full-scale mockup of an Indiana-class battleship, constructed as a naval exhibit. The German firm Krupp had a pavilion of artillery, which apparently had cost one million dollars to stage, including a coastal gun of 42 cm in bore (16.54 inches) and a length of 33 calibres (45.93 feet, 14 meters). A breech-loaded gun, it weighed 120.46 long tons (122.4 metric tons). According to the company's marketing: "It carried a charge projectile weighing from 2,200 to 2,500 pounds which, when driven by 900 pounds of brown powder, was claimed to be able to penetrate at 2,200 yards a wrought iron plate three feet thick if placed at right angles." Nicknamed "The Thunderer", the gun had an advertised range of 15 miles; on this occasion John Schofield declared Krupps' guns "the greatest peacemakers in the world". This gun was later seen as a precursor of the company's World War I Dicke Berta howitzers. The 1893 Parliament of the World's Religions, which ran from September 11 to September 27, marked the first formal gathering of representatives of Eastern and Western spiritual traditions from around the world. According to Eric J. Sharpe, Tomoko Masuzawa, and others, the event was considered radical at the time, since it allowed non-Christian faiths to speak on their own behalf; it was not taken seriously by European scholars until the 1960s. Along the banks of the lake, patrons on the way to the casino were taken on a moving walkway, the first of its kind open to the public, called The Great Wharf, Moving Sidewalk, it allowed people to walk along or ride in seats. Horticultural exhibits at the Horticultural Hall included cacti and orchids as well as other plants in a greenhouse. Most of the buildings of the fair were designed in the neoclassical architecture style. The area at the Court of Honor was known as The White City. Façades were made not of stone, but of a mixture of plaster, cement, and jute fiber called staff, which was painted white, giving the buildings their "gleam". Architecture critics derided the structures as "decorated sheds". The buildings were clad in white stucco, which, in comparison to the tenements of Chicago, seemed illuminated. It was also called the White City because of the extensive use of street lights, which made the boulevards and buildings usable at night. In 1892, working under extremely tight deadlines to complete construction, director of works Daniel Burnham appointed Francis Davis Millet to replace the fair's official director of color, William Pretyman. Pretyman had resigned following a dispute with Burnham. After experimenting, Millet settled on a mix of oil and white lead whitewash that could be applied using compressed air spray painting to the buildings, taking considerably less time than traditional brush painting. Joseph Binks, maintenance supervisor at Chicago's Marshall Field's Wholesale Store, who had been using this method to apply whitewash to the subbasement walls of the store, got the job to paint the Exposition buildings. Claims this was the first use of spray painting may be apocryphal since journals from that time note this form of painting had already been in use in the railroad industry from the early 1880s. Many of the buildings included sculptural details and, to meet the Exposition's opening deadline, chief architect Burnham sought the help of Chicago Art Institute instructor Lorado Taft to help complete them. Taft's efforts included employed a group of talented women sculptors from the Institute known as "the White Rabbits" to finish some of the buildings, getting their name from Burnham's comment "Hire anyone, even white rabbits if they'll do the work." The White City is largely credited for ushering in the City Beautiful movement and planting the seeds of modern city planning. The highly integrated design of the landscapes, promenades, and structures provided a vision of what is possible when planners, landscape architects, and architects work together on a comprehensive design scheme. The White City inspired cities to focus on the beautification of the components of the city in which municipal government had control; streets, municipal art, public buildings and public spaces. The designs of the City Beautiful Movement (closely tied with the municipal art movement) are identifiable by their classical architecture, plan symmetry, picturesque views, axial plans, as well as their magnificent scale. Where the municipal art movement focused on beautifying one feature in a city, the City Beautiful movement began to make improvements on the scale of the district. The White City of the World's Columbian Exposition inspired the Merchants Club of Chicago to commission Daniel Burnham to create the Plan of Chicago in 1909. The Manufactures and Liberal Arts Building, designed by George B. Post. If this building were standing today, it would rank second in volume and third in footprint on list of largest buildings (130,000m2, 8,500,000m3). It exhibited works related to literature, science, art and music. Louis Sullivan's polychrome proto-Modern Transportation Building was an outstanding exception to the prevailing style, as he tried to develop an organic American form. Years later, in 1922, he wrote that the classical style of the White City had set back modern American architecture by forty years. 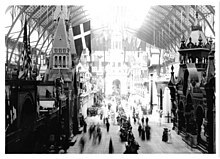 As detailed in Erik Larson's popular history The Devil in the White City, extraordinary effort was required to accomplish the exposition, and much of it was unfinished on opening day. The famous Ferris Wheel, which proved to be a major attendance draw and helped save the fair from bankruptcy, was not finished until June, because of waffling by the board of directors the previous year on whether to build it. Frequent debates and disagreements among the developers of the fair added many delays. The spurning of Buffalo Bill's Wild West Show proved a serious financial mistake. Buffalo Bill set up his highly popular show next door to the fair and brought in a great deal of revenue that he did not have to share with the developers. Nonetheless, construction and operation of the fair proved to be a windfall for Chicago workers during the serious economic recession that was sweeping the country. Almost all of the fair's structures were designed to be temporary; of the more than 200 buildings erected for the fair, the only two which still stand in place are the Palace of Fine Arts and the World's Congress Auxiliary Building. From the time the fair closed until 1920, the Palace of Fine Arts housed the Field Columbian Museum (now the Field Museum of Natural History, since relocated); in 1933 (having been completely rebuilt in permanent materials), the Palace building re-opened as the Museum of Science and Industry. The second building, the World's Congress Building, was one of the few buildings not built in Jackson Park, instead it was built downtown in Grant Park. The cost of construction of the World's Congress Building was shared with the Art Institute of Chicago, which, as planned, moved into the building (the museum's current home) after the close of the fair. Three other significant buildings survived the fair. The first is the Norway Building, a recreation of a traditional wooden stave church. After the Fair it was relocated to Lake Geneva, and in 1935 was moved to a museum called Little Norway in Blue Mounds, Wisconsin. In 2015 it was dismantled and shipped back to Norway, where it was restored and reassembled. The second is the Maine State Building, designed by Charles Sumner Frost, which was purchased by the Ricker family of Poland Spring, Maine. They moved the building to their resort to serve as a library and art gallery. The Poland Spring Preservation Society now owns the building, which was listed on the National Register of Historic Places in 1974. The third is the Dutch House, which was moved to Brookline, Massachusetts. The 1893 Viking ship that was sailed to the Exposition from Norway by Captain Magnus Andersen, is located in Geneva, Illinois. The ship is open to visitors on scheduled days April through October. The main altar at St. John Cantius in Chicago, as well as its matching two side altars, are reputed to be from the Columbian Exposition. Since many of the other buildings at the fair were intended to be temporary, they were removed after the fair. The White City so impressed visitors (at least before air pollution began to darken the façades) that plans were considered to refinish the exteriors in marble or some other material. These plans were abandoned in July 1894, when much of the fair grounds was destroyed in a fire. The Administration Building and Grand Court during the October 9, 1893, commemoration of the 22nd anniversary of the Chicago Fire. Helen Keller, along with her mentor Anne Sullivan and Dr. Alexander Graham Bell, visited the fair in summer of 1893. Keller described the fair in her autobiography The Story of My Life. Early in July, a Wellesley College English teacher named Katharine Lee Bates visited the fair. The White City later inspired the reference to "alabaster cities" in her poem "America the Beautiful". The exposition was extensively reported by Chicago publisher William D. Boyce's reporters and artists. There is a very detailed and vivid description of all facets of this fair by the Persian traveler Mirza Mohammad Ali Mo'in ol-Saltaneh written in Persian. He departed from Persia on April 20, 1892, especially for the purpose of visiting the World's Columbian Exposition. Pierre de Coubertin visited the fair with his friends Paul Bourget and Samuel Jean de Pozzi. He devotes the first chapter of his book " Souvenirs d'Amérique et de Grèce " (1897) to the visit. Swami Vivekananda visited the fair to attend the Parliament of the World's Religions and delivered his famous speech "Sisters and Brothers of America!". Kubota Beisen was an official delegate of Japan. As an artist, he sketched hundreds of scenes, some of which were later used to make woodblock print books about the Exhibition. Serial Killer Herman Mudgett (H. H. Holmes) attended the fair with two of his victims, Annie and Minnie Williams. Examples of exposition souvenirs can be found in various American museum collections. One example, copyrighted in 1892 by John W. Green, is a folding hand fan with detailed illustrations of landscapes and architecture. Charles W Goldsmith produced a set of ten postcard designs, each in full colour, showing the buildings constructed for the exhibition. Columbian Exposition coins were also minted for the event. The fair ended with the city in shock, as popular mayor Carter Harrison, Sr. was assassinated by Patrick Eugene Prendergast two days before the fair's closing. Closing ceremonies were canceled in favor of a public memorial service. Jackson Park was returned to its status as a public park, in much better shape than its original swampy form. The lagoon was reshaped to give it a more natural appearance, except for the straight-line northern end where it still laps up against the steps on the south side of the Palace of Fine Arts/Museum of Science & Industry building. The Midway Plaisance, a park-like boulevard which extends west from Jackson Park, once formed the southern boundary of the University of Chicago, which was being built as the fair was closing (the university has since developed south of the Midway). The university's football team, the Maroons, were the original "Monsters of the Midway". The exposition is mentioned in the university's alma mater: "The City White hath fled the earth,/But where the azure waters lie,/A nobler city hath its birth,/The City Gray that ne'er shall die." Electricity was used to decorate the buildings with incandescent lights, illuminate fountains, and power three huge spotlights. World's Fair Tesla alternating current and electromechanical presentation. The effort to power the Fair with electricity, which became a demonstration piece for Westinghouse Electric and the alternating current system they had been developing for many years, took place at the end of what has been called the War of the currents between DC and AC. Westinghouse initially did not put in a bid to power the Fair but agreed to be the contractor for a local Chicago company that put in a low bid of US$510,000 to supply an alternating current based system. Edison General Electric, which at the time was merging with the Thomson-Houston Electric Company to form General Electric, put in a US$1,720,000 bid to power the Fair and its planned 93,000 incandescent lamps with direct current. After the Fair committee went over both proposals, Edison General Electric re-bid their costs at $554,000 but Westinghouse under bid them by 70 cents per lamp to get the contract. Westinghouse could not use the Edison incandescent lamp since the patent belonged to General Electric and they had successfully sued to stop use of all patent infringing designs. Since Edison specified a sealed globe of glass in his design Westinghouse found a way to sidestep the Edison patent by quickly developing a lamp with a ground glass stopper in one end, based on a Sawyer-Man "stopper" lamp patent they already had. The lamps worked well but were short lived, requiring a small army of workmen to constantly replace them. Westinghouse Electric had severely underbid the contract and struggled to supply all the equipment specified including twelve 1,000 horsepower single phase AC generators and all the lighting and other equipment required. They also had to fend off a last minute lawsuit by General Electric claiming the Westinghouse Sawyer-Man based stopper lamp infringed on the Edison incandescent lamp patent. The International Exposition held an Electricity Building which was devoted to electrical exhibits. A statue of Benjamin Franklin was displayed at the entrance. The exposition featured interior and exterior light and displays as well as displays of Thomas Edison's kinetoscope, search lights, a seismograph, electric incubators for chicken eggs, and Morse code telegraph. All the exhibits were from commercial enterprises. Participants included General Electric, Brush, Western Electric, and Westinghouse. The Westinghouse Company displayed several polyphase systems. The exhibits included a switchboard, polyphase generators, step-up transformers, transmission line, step-down transformers, commercial size induction motors and synchronous motors, and rotary direct current converters (including an operational railway motor). The working scaled system allowed the public a view of a system of polyphase power which could be transmitted over long distances, and be utilized, including the supply of direct current. Meters and other auxiliary devices were also present. Part of the space occupied by the Westinghouse Company was devoted to demonstrations of electrical devices developed by Nikola Tesla including a two-phase induction motor, and generators to power the system. Tesla demonstrated a series of electrical effects, some which were in previous lectures performed in America and Europe. These included his "Egg of Columbus", a metal egg that spun on a disk in a demonstraton of an electric motor’s rotating magnetic field, and a high-voltage, high-frequency alternating current demonstration where a near by coil lit a wireless gas-discharge lamp held in his hand. Also at the Fair, the Chicago Athletic Association Football team played one of the very first night football games against West Point (the earliest being on September 28, 1892 between Mansfield State Normal and Wyoming Seminary). Chicago won the game 14-0. The game lasted only 40 minutes, compared to the normal 90 minutes. Joseph Douglass, classical violinist, who achieved wide recognition after his performance there and became the first African-American violinist to conduct a transcontinental tour and the first to tour as a concert violinist. Sissieretta Jones, a soprano known as "the Black Patti" and an already-famous opera singer. A paper on African-American spirituals and shouts by Abigail Christensen was read to attendees. There were many other black artists at the fair, ranging from minstrel and early ragtime groups to more formal classical ensembles to street buskers. Scott Joplin, pianist, from Texarkana, Texas; became widely known for his piano playing at the fair. John Philip Sousa′s Band played for the Exposition dedication celebration in Chicago, 10 October through 21 October 1892. The first Indonesian music performance in the United States was at the exposition. The gamelan instruments used in the performance were later placed in the Field Museum of Natural History. A group of hula dancers led to increased awareness of Hawaiian music among Americans throughout the country. Stoughton Musical Society, the oldest choral society in the United States, presented the first concerts of early American music at the exposition. The first eisteddfod (a Welsh choral competition with a history spanning many centuries) held outside Wales was held in Chicago at the exposition. A 250-voice Mormon Tabernacle Choir competed in the Eisteddfod taking the second place prize of $1000. This was the first appearance of the Choir outside the Utah territory. August 12, 1893 – Antonín Dvořák conducted a gala "Bohemian Day" concert at the exposition, besieged by visitors including the conductor of the Chicago Symphony, who arranged for performance of Dvořák's American string quartet, just completed in Spillville, Iowa, during a Dvořák family vacation in a Czech-speaking community there. American composer Amy Beach (1867-1944) was commissioned by the Board of Lady Managers of the fair to compose a choral work (Festival Jubilate, op. 17) for the opening of the Woman's Building. Sousa′s Band played concerts in the south bandstand on the Great Plaza, 25 May to 28 June 1893. The University of Illinois Military Band conducted by student leaders Charles Elder and Richard Sharpe played concerts twice daily in the Illinois Building 9 June to 24 June 1893. Soloists were William Sandford, euphonium; Charles Elder, clarinet; William Steele, cornet. The band members slept on cots on the top floor of the building. 8 June 1893 — The Exposition Orchestra, an expanded version of the Chicago Symphony conducted by guest conductor Vojtěch I. Hlaváč, played the American premiere of Modest Mussorgsky's A Night on Bald Mountain as part of a concert of Russian folk music. The women artists at the Woman's Building included Anna Lownes, Viennese painter Rosa Schweninger, and many others. American composer Amy Cheney Beach was commissioned by the Board of Lady Managers of the fair to compose a choral work (Festival Jubilate, op. 17) for the opening of the Woman's Building. 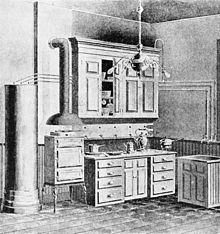 Women inventions, such as the Mrs Potts sad-iron system was on display. Ami Mali Hicks' stencil design was selected to adorn the frieze in the assembly room of the Women's Building. The Woman's Building included a Woman's Building Library Exhibit, which had seven thousand books-all by women. The Woman's Building Library was meant to show the cumulative contribution of the world's women to literature. Frederick Jackson Turner lectured on his Frontier thesis. The Pledge of Allegiance was first performed at the exposition by a mass of school children lined up in military fashion. Contribution to Chicago's nickname, the "Windy City". Some argue that Charles Anderson Dana of the New York Sun coined the term related to the hype of the city's promoters. Other evidence, however, suggests the term was used as early as 1881 in relation to either Chicago's "windbag" politicians or to its weather. The First-Ever Brownie was invented by Bertha Palmer for the 1893 World’s Columbian Exposition. Aunt Jemima pancake mix was widely popularized by spokesperson Nancy Green's pancake cooking and story telling performances. Vienna Sausage started selling its frankfurters and sausages near one of the entrances to the Midway Plaisance, just outside the Old Vienna Village. The company later became known as Vienna Beef, famously recognized as "Chicago's Hot Dog". A device that made plates for printing books in Braille, unveiled by Frank Haven Hall, who met Helen Keller and her teacher Anne Sullivan at the exhibit. The third rail giving electric power to elevated trains led directly to its first continuing US use. A first prototype of spray, by Francis Davis Millet. The poet and humorist Benjamin Franklin King, Jr. first performed at the exposition. Bodybuilder Eugen Sandow demonstrated feats of strength, promoted by Florenz Ziegfeld. The exposition was one influence leading to the rise of the City Beautiful movement. Results included grand buildings and fountains built around Olmstedian parks, shallow pools of water on axis to central buildings, larger park systems, broad boulevards and parkways and, after the start of the 20th century, zoning laws and planned suburbs. Examples of the City Beautiful movement's works include the City of Chicago, the Columbia University campus, and the National Mall in Washington D.C.
After the fair closed, J.C. Rogers, a banker from Wamego, Kansas, purchased several pieces of art that had hung in the rotunda of the U.S. Government Building. He also purchased architectural elements, artifacts and buildings from the fair. He shipped his purchases to Wamego. Many of the items, including the artwork, were used to decorate his theater, now known as the Columbian Theatre. Memorabilia saved by visitors can still be purchased. Numerous books, tokens, published photographs, and well-printed admission tickets can be found. While the higher value commemorative stamps are expensive, the lower ones are quite common. So too are the commemorative half dollars, many of which went into circulation. Although not available for purchase, The George Washington University maintains a small collection of exposition tickets for viewing and research purposes. The collection is currently cared for by GWU's Special Collections Research Center, located in the Estelle and Melvin Gelman Library. When the exposition ended the Ferris Wheel was moved to Chicago's north side, next to an exclusive neighborhood. An unsuccessful Circuit Court action was filed against the owners of the wheel to have it moved. 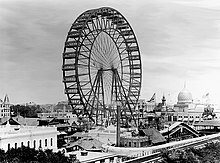 The wheel stayed there until it was moved to St. Louis for the 1904 World's Fair. The Columbian Exposition has celebrated many anniversaries since the fair in 1893. The Chicago Historical Society held an exhibition to commemorate the fair. The Grand Illusions exhibition was centered around the idea that the Columbian Exposition was made up of a series of illusions. 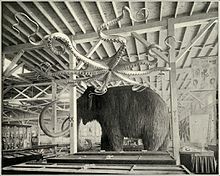 The commemorative exhibition contained partial reconstructions, a video detailing the fair, and a catalogue similar to the one sold at the World's Fair of 1893. Benjamin W. Kilburn, stereoscopic view concession and subsequent views of the Colombian World's Exposition. Against the Day, a fictional novel that takes place during the Exposition during the first act. Expo: Magic of the White City, a 2005 documentary film about the exposition by Mark Bussler. The Will of an Eccentric, an adventure novel by Jules Verne. The World's Columbian Exposition is evoked with admiration in the early chapters. The Exposition appears in the season 1 episode "The World's Columbian Exposition" of the NBC series Timeless. In the episode, Rufus and Wyatt follow the mothership to the Exposition in 1893 to save Lucy from Garcia Flynn, but soon get trapped by Flynn at the World's Fair Hotel. After getting help from Harry Houdini to get away from Flynn, Lucy and Houdini go to the hotel and save Rufus and Wyatt, but Lucy soon gets kidnapped by H.H. Holmes and is nearly killed until she is saved by Rufus and Wyatt. The Exposition is referenced in Sufjan Stevens's song in his album Come on Feel the Illinoise, "Come On! Feel The Illinoise! ", which consists of two parts. Part 1 is titled, "World's Columbian Exposition". Ramsland, Katherine. “H. H. Holmes: Master of Illusion”. crime library. 2014. October 1, 2014. Placko, Dane. “Chilling Tour inside Serial Killer H. H. Holmes’ ‘Murder Castle’”. My Fox Chicago. Apr. 28, 2014. Oct 2, 2014. French, Leanne; Grimm, Laura; Pak, Eudie. “H. H. Holmes Biography”. Biography. 2014. October 1, 2014. ^ a b Truman, Benjamin (1893). 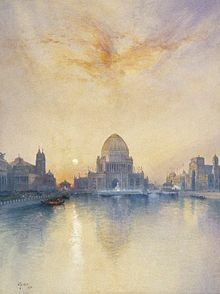 History of the World's Fair: Being a Complete and Authentic Description of the Columbian Exposition From Its Inception. 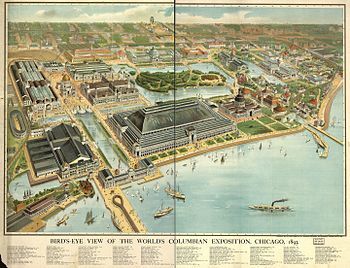 Philadelphia, PA: J. W. Keller & Co.
^ a b c d e f g h i "Bird's-Eye View of the World's Columbian Exposition, Chicago, 1893". World Digital Library. 1893. Archived from the original on 2013-10-14. Retrieved 2013-07-17. 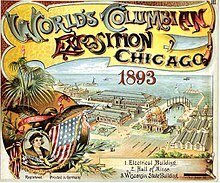 ^ "World's Columbian Exposition". Encyclopædia Britannica. Archived from the original on 2017-07-13. Retrieved 14 November 2016. ^ Lawson, Erik (2003). The Devil in the White City: Murder, Magic, and Madness at the Fair that Changed America. New York: Vintage Books. ISBN 0-609-60844-4. ^ Lawson, Erik (2003). The Devil in the White City: Murder, Magic, and Madness at the Fair that Changed America. New York: Vintage Books. pp. 318–320. ISBN 0-609-60844-4. ^ "Municipal Flag of Chicago". Chicago Public Library. 2009. Archived from the original on 2013-06-15. Retrieved 2009-03-04. ^ "Baker Has Resigned". Chicago Daily Tribune. 19 August 1892. p. 1. ^ Moses Purnell Handy, "The Official Directory of the World's Columbian Exposition, May 1st to October 30th, 1893: A Reference Book of Exhibitors and Exhibits, and of the Officers and Members of the World's Columbian Commission Books of the Fairs" (William B. Conkey Co., 1893) P. 75 (See: Google Books). See also: Memorial Volume. Joint Committee on Ceremonies, Dedicatory And Opening Ceremonies of the World's Columbian Exposition: Historical and Descriptive, A. L. Stone: Chicago, 1893. P. 306. ^ a b ""World's Columbian Exposition", Encyclopedia of Chicago". Archived from the original on 2011-11-21. Retrieved 2011-11-14. ^ "World's Columbian Exposition: The Official Fair--A History". Archived from the original on 2011-11-09. Retrieved 2011-11-14. ^ see introduction of 2013 edition of Rydell, Robert W. All the world's a fair: Visions of empire at American international expositions, 1876-1916. University of Chicago Press, 2013. ^ Rydell, Robert W. (1987).All the World's a Fair: Visions of Empire at American International Expositions Archived 2014-08-24 at the Wayback Machine, p. 53. University of Chicago. ISBN 0-226-73240-1. ^ "Thursday". The Junction City Weekly Union. 17 December 1892. Retrieved 10 January 2017 – via Newspapers.com. ^ "To Urge Sunday Opening of the Fair". Chicago Daily Tribune. 10 January 1893. Retrieved 10 January 2017 – via Newspapers.com. ^ "Woman's Club Opposes Sunday Closing". Chicago Daily Tribune. 11 December 1892. Retrieved 10 January 2017 – via Newspapers.com. ^ Harper, Douglas. "midway". Chicago Manual Style (CMS). Online Etymology Dictionary. Archived from the original on 2013-06-16. Retrieved 12 April 2013. ^ Carvajal, Carol Styles and Horwood, Jane. Concise Oxford Spanish Dictionary: Spanish-English/English-Spanish. Oxford Press, 2004, page 578. ^ Trumble White, William Iglehart, and George R. Davis, The World's Columbian Exposition, Chicago 1893 (1893), at 493; James C. Clark, "What Happened to the Nina, Pinta and Santa Maria that Sailed in 1892? ", Orlando Sentinel, May 10, 1992. ^ "The World's Columbian Exposition (1893)". The American Experience. PBS. 1999. Archived from the original on 2009-04-16. Retrieved 2009-12-21. ^ a b c d e f g Larson, Erik (2003). The Devil in the White City: Murder, Magic and Madness at the Fair that Changed America. New York, NY: Crown. ISBN 0-609-60844-4. ^ Adams, Cecil (2007-02-27). "What is the origin of the song "There's a place in France/Where the naked ladies dance?" Are bay leaves poisonous?". The Straight Dope. Archived from the original on 2010-04-01. Retrieved 2009-12-21. ^ "Cutter, Kirtland Kelsey (1860-1939), Architect". Archived from the original on 2005-11-19. Retrieved 2005-09-13. ^ "Arts & Crafts Movement Furniture". Archived from the original on 2005-08-27. Retrieved 2005-09-13. ^ Nepstad, Peter. "The Viking Shop in Jackson Park" (PDF). Hyde Park Historical Society. Archived (PDF) from the original on 2009-02-05. Retrieved 2009-01-24. ^ Smith, Gerry (2008-06-26). "Viking ship from 1893 Chicago world's fair begins much-needed voyage to restoration". Chicago Tribune. Tribune Company. Archived from the original on 2016-08-21. Retrieved 2009-01-24. ^ "Kate McPhelim Cleary: A Gallant Lady Reclaimed" Archived 2009-01-07 at the Wayback Machine Lopers.net. Accessed October 6, 2008. ^ Behling, Laura L. (October 2002). "Reification and Resistance: The Rhetoric of Black Womanhood at the Columbian Exposition, 1893". Women's Studies in Communication. 25 (2): 173–196. doi:10.1080/07491409.2002.10162445. ISSN 0749-1409. ^ a b Chaim M. Rosenberg (2008). America at the fair: Chicago's 1893 World's Columbian Exposition. Arcadia Publishing. pp. 229–230. ISBN 978-0-7385-2521-1. ^ John Birkinbine (1893) "Prominent Features of the World's Columbian Exposition", Engineers and engineering, Volume 10, p. 292; for the metric values see Ludwig Beck (1903). Die geschichte des eisens in technischer und kulturgeschiehtlicher beziehung: abt. Das XIX, jahrhundert von 1860 an bis zum schluss. F. Vieweg und sohn. p. 1026. ^ Hermann Schirmer (1937). Das Gerät der Artillerie vor, in und nach dem Weltkrieg: Das Gerät der schweren Artillerie. Bernard & Graefe. p. 132. Der Schritt von einer kurze 42-cm-Kanone L/33 zu einer Haubitze mit geringerer Anfangsgeschwindigkeit und einem um etwa 1/5 geringeren Geschossgewicht war nich sehr gross. ^ Masuzawa, Tomoko (2005). The Invention of World Religions. Chicago University of Chicago Press. pp. 270–274. ISBN 978-0-226-50989-1. ^ "The History of Sprayguns - Body Shop Business". 1 September 2000. Archived from the original on 2016-09-04. Retrieved 2016-08-19. ^ "The Contentious Historical Origins of Spray Paint". Archived from the original on 2018-07-19. Retrieved 2016-08-20. ^ Levy, John M. (2009) Contemporary Urban Planning. ^ Keene, Jennifer (2013). Visions of America: A History of the United States Since 1865. London: Pearson. pp. 508, 510. ISBN 978-0205251636. ^ Sullivan, Louis (1924). Autobiography of an Idea. New York City: Press of the American institute of Architects, Inc.. p. 325. ^ Journal, Barry Adams | Wisconsin State. "The journey for the Norway Building comes full circle". madison.com. Archived from the original on 2018-07-09. Retrieved 2018-07-09. ^ "Friends of the Viking Ship". Archived from the original on 2018-10-11. Retrieved 2018-11-20. ^ "The Story of My Life". digital.library.upenn.edu. Archived from the original on 2016-01-14. Retrieved 2016-01-03. ^ Muʿīn al-Salṭana, Muḥammad ʿAlī (Hāǧǧ Mīrzā), Safarnāma-yi Šīkāgū : ḵāṭirāt-i Muḥammad ʿAlī Muʿīn al-Salṭana bih Urūpā wa Āmrīkā : 1310 Hiǧrī-yi Qamarī / bih kūšiš-i Humāyūn Šahīdī, [Tihrān] : Intišrāt-i ʿIlmī, 1984, 1363/. ^ "Sisters And Brothers Of America". www.swamivivekanandaquotes.org. Archived from the original on 2016-10-22. Retrieved 2016-10-22. ^ "Fan". Online Collections Database. Staten Island Historical Society. Archived from the original on 2017-09-16. Retrieved 6 January 2014. ^ Willoughby, Martin (1992). A History of Postcards. London England: Bracken Books. p. 42. ISBN 1858911621. ^ "The World's Columbian Exposition". Archived from the original on 2016-06-16. Retrieved 2015-11-21. ^ Electricity at the Columbian Exposition. By John Patrick Barrett. p165-170. ^ a b "Tesla". Archived from the original on 2016-05-19. Retrieved 2015-11-21. ^ Dommermuth-Costa, Carol. Nikola Tesla: A Spark of Genius. p. 90. ^ Caldwell Titcomb (Spring 1990). "Black String Musicians: Ascending the Scale". Black Music Research Journal. Center for Black Music Research - Columbia College Chicago and University of Illinois Press. 10 (1): 107–112. doi:10.2307/779543. JSTOR 779543. ^ Terry Waldo (1991). This is Ragtime. Da Capo Press. ^ Brunvand, Jan Harold (1998). "Christensen, Abigail Mandana ("Abbie") Holmes (1852-1938)". American folklore: an encyclopedia. Taylor & Francis. p. 142. ISBN 978-0-8153-3350-0. ^ Diamond, Beverly; Barbara Benary. "Indonesian Music". The Garland Encyclopedia of World Music. pp. 1011–1023. ^ Stillman, Amy Ku'uleialoha. "Polynesian Music". The Garland Encyclopedia of World Music. pp. 1047–1053. ^ "Dvořák in America". DVOŘÁK AMERICAN HERITAGE ASSOCIATION. Archived from the original on 2016-03-04. Retrieved 2015-12-07. ^ a b Brittain, Randy Charles. "Festival Jubilate, Op. 17 by Amy Cheney Beach (1867-1944): A Performing Edition." Ph.D. Dissertation: University of North Carolina, Greensboro, 1994. ^ Program notes by Phillip Huscher for a performance by the Chicago Symphony Orchestra conducted by Riccardo Muti at the Krannert Center for the Performing Arts, Urbana, Ill. 24 September 2016. pp. 6-7. 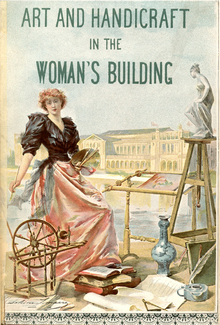 ^ "Women's Building: 1893 World's Exposition". Women's Art at the World's Columbian Fair & Exposition, Chicago 1893. Archived from the original on 2014-10-10. Retrieved 2014-11-09. ^ "United States Women Painters: 1893 Exposition - page 4". Women's Art at the World's Columbian Fair & Exposition, Chicago 1893. Archived from the original on 2014-11-09. Retrieved 2014-11-09. ^ "United States Women Painters: 1893 Exposition, page 8". Women's Art at the World's Columbian Fair & Exposition, Chicago 1893. Archived from the original on 2014-11-09. Retrieved 2014-11-09. ^ "U.S. Senate: Abraham Lincoln". U.S. Senate. Retrieved 22 December 2018. ^ "Chicago - Columbus Landing on San Salvador". Archived from the original on 2014-12-17. Retrieved 2014-11-09. ^ Nichols, K. L. "International Women Sculptors: 1893 Chicago World's Fair and Exposition". Archived from the original on 2017-01-09. Retrieved 2017-01-09. ^ Eleanor Tufts; National Museum of Women in the Arts (U.S.); International Exhibitions Foundation (1987). American women artists, 1830-1930. International Exhibitions Foundation for the National Museum of Women in the Arts. ISBN 978-0-940979-01-7. ^ "Austrian Women Painters: 1893 Chicago World's Fair & Exposition". Women's Art at the World's Columbian Fair & Exposition, Chicago 1893. Archived from the original on 2014-11-09. Retrieved 2014-11-09. ^ "A Visit with Mrs. Potts". Costumed Interpretations. Ellie Presents. Archived from the original on 2017-08-20. Retrieved May 13, 2017. ^ "Miss Amy Hick's Design". New York, New York: The New York World. April 8, 1893. p. 8. Archived from the original on 2017-08-19. Retrieved 19 August 2017 – via Newspapers.com. ^ Murray, Stuart (2009). The Library An Illustrated History. New York, NY: Skyhorse Publishing. p. 207. ISBN 9781602397064. ^ "Frederick Jackson Turner". Pbs.com. PBS. Archived from the original on 2014-02-17. Retrieved 27 March 2014. ^ Giddings, Paula (2008). Ida: A Sword Among Lions. HarperCollins. p. 270. ISBN 978-0-06-051921-6. ^ "Commemoratives from 1892-1954". The United States Mint.gov. Archived from the original on 2014-02-27. Retrieved 20 February 2014. 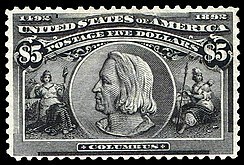 ^ "The Columbian Exposition and the Nation's First Commemorative Stamps". National Postal Museum. National Postal Museum. Archived from the original on 2016-03-04. Retrieved 27 March 2014. ^ Hill, Genna (Sep 24, 2010). The 2011 Chicago North Side Real Estate Guide: Bucktown, Wicker Park, Lincoln Park, Lake View, Gold Coast, Streeterville. Andersonville, Wrigleyville, Ravenswood and More. Wexford House Books. pp. 73–74. ^ Giddings, Paula (2008). Ida: A Sword Among Lions. HarperCollins. p. 273. ISBN 978-0-06-051921-6. ^ Talen, Emily (2005).New Urbanism and American Planning: The Conflict of Cultures, p. 118. Routledge. ISBN 0-415-70133-3. ^ Harris, N. (1993). Grand Illusions Chicago' World's Fair of 1893. Chicago: Chicago Historical Society. 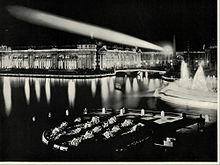 Wikimedia Commons has media related to World's Columbian Exposition. 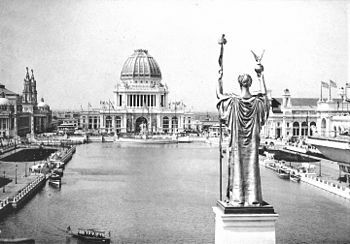 The 1893 World's Fair in Chicago (worldsfairchicago1893.com). A standalone website that covers all aspects of the Exposition. Retrieved March 30, 2019. 1893 Chicago section of Jon Paul Sank's World's Fairs Page. The section has more than 150 links to websites, videos, lectures, podcasts, guides, pictures, music, books, catalogues, and more. Retrieved March 27, 2019. The 1893 World's Columbian Exposition Reading Room.